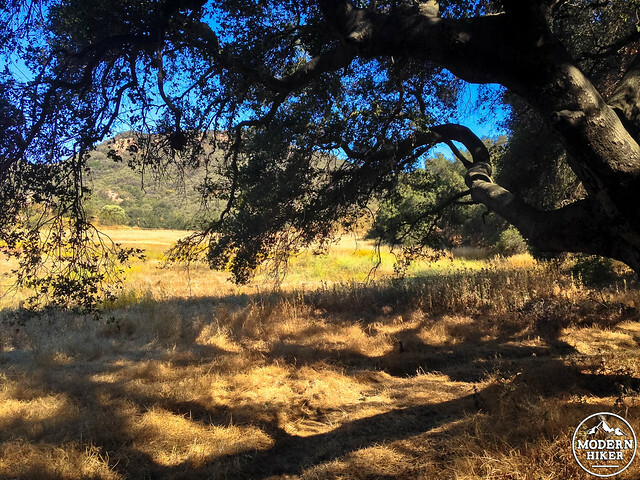 Rocky Oaks Park is a small but beautiful slice of protected land in the Santa Monica Mountains National Recreation Area. 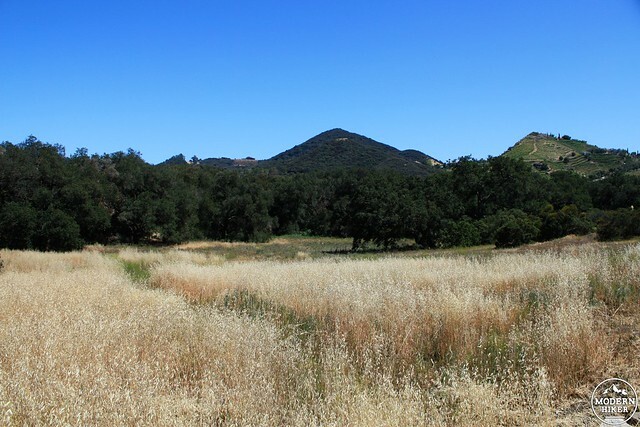 Managed by the National Park Service, this former ranch land holds a shaded picnic area covered by beautiful live oaks, a man-made seasonal pond that (when it has water in it) serves as a rest stop for migratory birds, and an easy system of trails that serve as a kid-friendly day trip, a stop on a longer trek through the Santa Monica Mountains, or as a place to relax after visiting one of the nearby wineries. 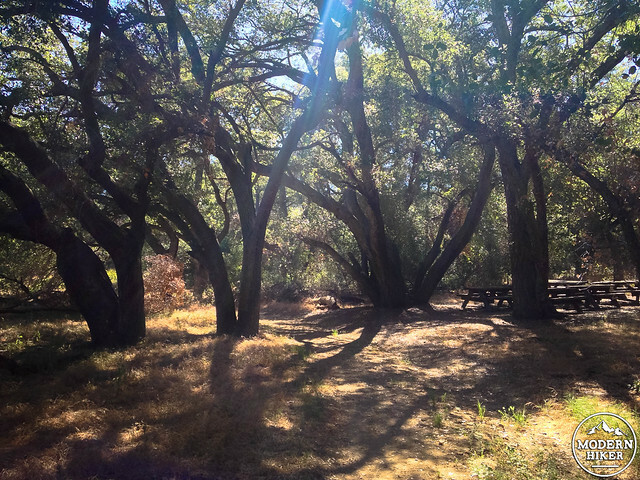 This 1.2 mile loop mostly follows the Rocky Oaks Loop Trail, although there are places to explore if you want to spend more time in the park. Begin from the western end of the parking area near the restrooms. The trail heads north past an old fenced-off remnant of the area’s ranch days. At the first junction about 180 feet from the parking area, stay to the left to start on the Loop Trail. 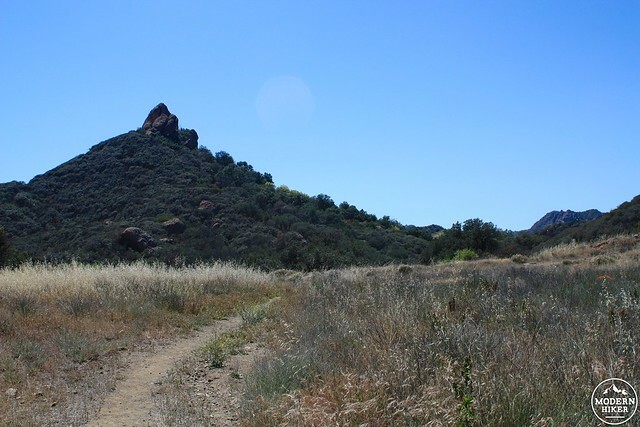 The route leaves the dappled shade of the parking area and enters into a small meadow with some exemplary views of Santa Monica Mountain terrain to the west — in front of you, a prominent but unnamed formation hides the slightly larger Saddle Rock directly behind it. At 0.2 miles, head straight at the junction to take the higher trail to the northeast (the trail to the left dead-ends at private property, the trail to your right is where you’ll return). 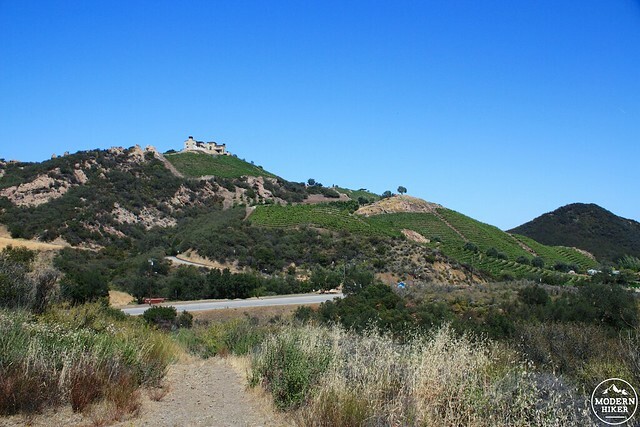 The trail climbs a bit in elevation and unveils views of the vineyards and estate wineries just across Kanan Road. 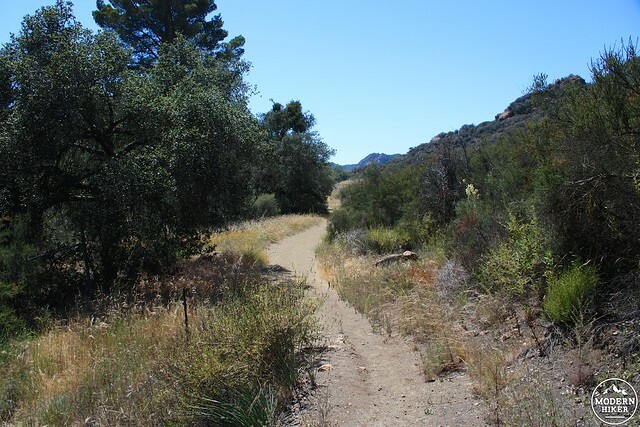 The trail here is lined with California buckwheat and copious amounts of black sage — some of the most black sage I’ve seen on any trail in the Los Angeles region (and definitely the most on an easy trail). If you’re like me and the scent of this stuff is like human catnip, you will definitely want to time a trip here in the early spring to catch the fragrant bushes in bloom. 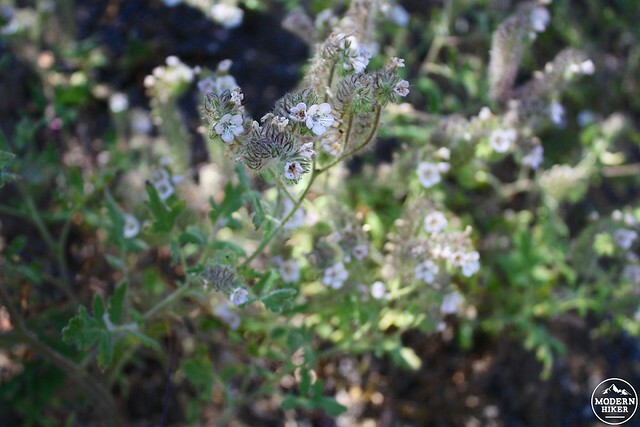 Even in the late spring, though, hikers can still find plenty of wildflowers blooming on the shadier slopes. 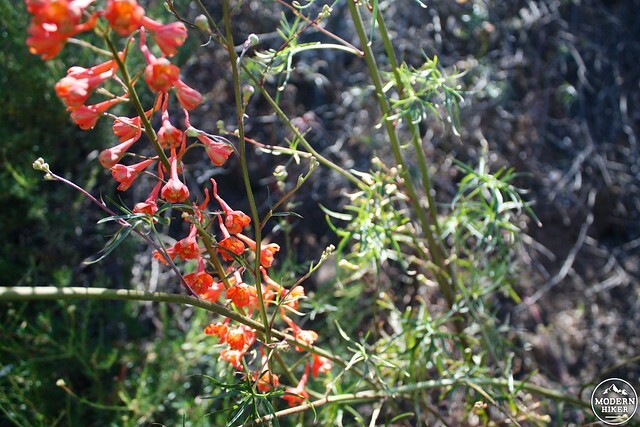 Look for Caterpillar Phacelia and showy Cardinal Larkspur here even into late May. 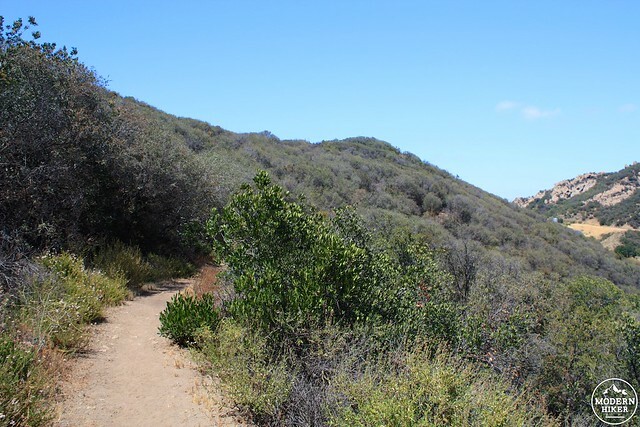 At 0.4 miles, a short spur trail will take you to an overlook of the park or you can continue north. 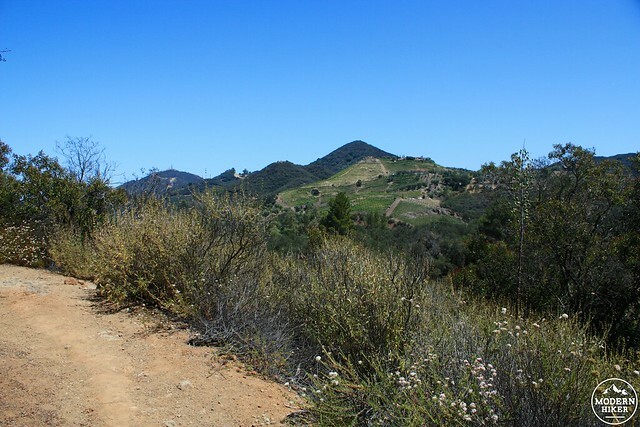 The Loop Trail bends toward the northeast and heads toward the palatial Malibu Rocky Oaks Estate Vineyards. At 0.7 miles, the trail makes a sharp right hand turn at a locked gate and chain link fence near Kanan Road. Here, the trail joins the drainage of the creek bed that leads to the man-made pond at the center of the park, and the flora becomes a bit more riparian. You’ll note more oak trees (young and old) as well as some invasive Spanish broom here. The coastal sage scrub opens up to grassland and oaks — and even though you can still hear the traffic (and oftentimes, the extra loud motorcycles and classic cars) on the nearby roads, it’s easy to imagine that most of California used to look just like this. At 0.9 miles, veer slightly to the left. Just past this, take a right at the next junction to head south on the Pond Trail to cross the man-made dam at the pond or continue straight to head through the Glade Trail for some spectacular native oaks, a shaded picnic area, and an outdoor amphitheater (after passing a HUGE colony of black sage and buckwheat). The Glade Trail will return you to the parking area while the Pond Trail will bring you back to the first meadow you passed. Very good. Trails are easy to follow and well-maintained. Many junctions are without signs but the park is small enough that it would be very difficult to get lost. 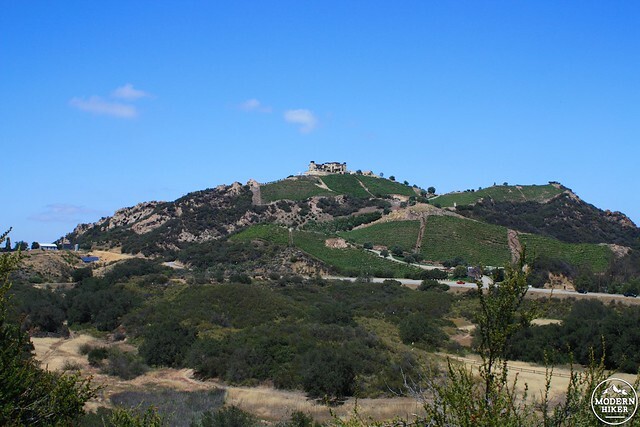 From the 101, take the Kanan Road exit south in Agoura Hills. In 6.2 miles, turn right onto Mulholland Highway. The entrance to Rocky Oaks Park will be on your right. Rocky Oaks was destroyed by the fire in November. Closed until further notice. Great blog! Love the many pictures and the easy to read maps. Keep up the good work. The lands of my people!